See the Ear Examination Simulator and Basic Nursing Set at First Aid Store™ - Specially molded to exactly simulate external and internal physical appearance and dimensions, the plug-in removable ears are easily changed. 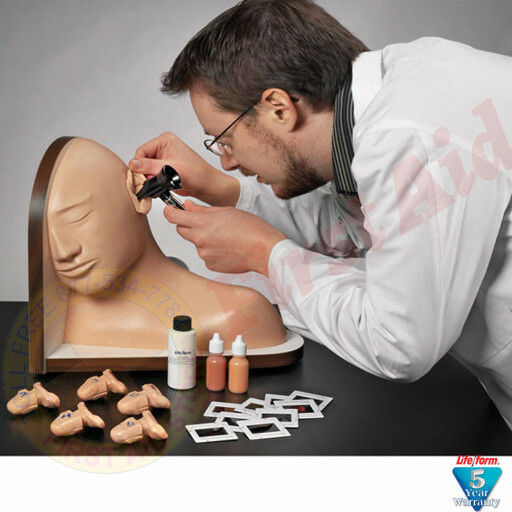 Life/form Ear Examination Simulator includes normal tympanic membrane (photo embedded); mucoid otitis media (photo embedded); serous otitis media with fluid level (photo embedded); chronic otitis media with perforation (photo embedded); normal tympanic membrane with slanted ear canal (photo embedded); normal ear without photo for earwax removal exercise; two tubes of synthetic earwax; a set of nine 35 mm slides; instructions; and hard carrying case. One-year warranty. 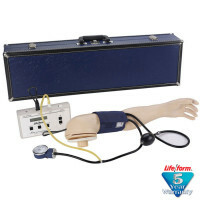 The Life/form® Ear Examination Simulator and Basic Nursing Set.